← Judge Willis on the front page of today’s Age? Not quite…. 2003 (2005 translation from French), 264p. Well, that’s 264-pages-reading-time that I’m not going to get back again. 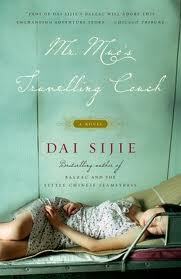 Dai Sijie is the author of Balzac and the Little Chinese Seamstress, and there are similarities between the two books. Both books revolve around the power of European literature (Balzac in the earlier book; Freud in this book); both refer to the ‘re-education’ policies of the Cultural Revolution; both books involve journeys. But where there was the theme of innocence and awakening in his first book, the major plotline of this novel is that Mr Muo, recently returned from France where he qualified as a psychoanalyst, needs to find a virgin to offer as a bribe so that his girlfriend can be released from prison. All rather grubby really. He speaks (albeit almost casually) of post-Cultural Revolution and post-Tienanmen Square China, and I did find that interesting. I was wondering when it was going to expand into a full-blown critique, but it remained very subtle- unless it passed completely over my head. I know very little about Freudianism but the author’s use of it all seemed rather obvious and simplistic. I am, however, very ready to concede that there might be nuances and critiques of Freud here that may have also passed completely over my head. (I’m wondering if Freud in Oceania has read it?) I kept waiting for this book to DO something, but alas it never did. In fact, I don’t know if anything happened at all or whether it was all a dream after all. Even more disconcerting were the blurbs front and back that described it as ‘hilarious’ and ‘amusing charming read with a sharp, satirical edge’ and ‘allusive, intelligent and very funny’. I obviously have a different sense of humour from such readers. Read because: it was a bookgroup choice for February (even though I won’t be there for the meeting). Boy, I’m glad I didn’t choose THIS book! I did a post on this back in 2007. You may be interested, as at that time I rather enjoyed the book! Wow, you certainly found more in the book than I did. I just didn’t find anything funny in it at all. It’s the time lost, isn’t it? Reading time is precious, we feel defrauded when a book turns out to be a dud. Thanks for this Janine … Funnily enough, I was looking at my TBR pile just yesterday and saw this there. It was given to me a few years ago but I wasn’t particularly inspired to read it. I think I might add it to the pile to go. Maybe it’s a good read as Neil says, but I have so many books higher in my reading priority and I have read Balzac (like you), so I think I’ll move it on.